ELEGANT, STURDY DESIGN: Beautiful giara glass bottles are made of durable transparent glass built for reuse. The grolsch flip-top bottles are dishwasher safe and the strong glass body offers superior resistance to impact and temperature changes. At 33.75 ounces per bottle, you'll have plenty to serve at your next party. MULTI-PURPOSE STORAGE: Store liquid beverages, oil, vinegar, water, kefir or kombucha. Our leak-proof swing cap are easy to remove and also perfect for fresh pressed juices as it prevents oxidation, keeping vital enzymes and nutrients from deteriorating quickly, making the juice last for longer. 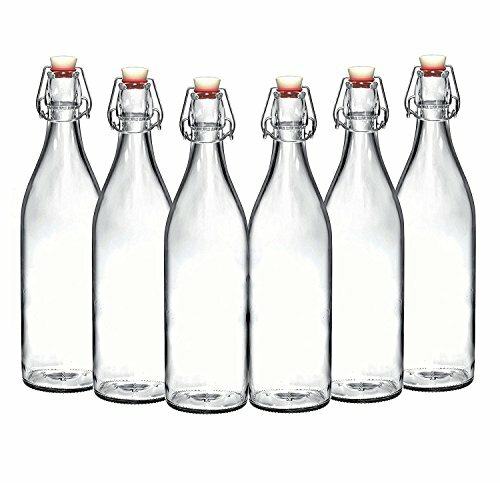 DURABLE & RESEALABLE AIR-TIGHT CAPS: Plastic & rubber fliptop gaskets are easy to remove and put on, keeping your homemade beverages sealed, preserving carbonation or fermentation. SET OF 2 OR 6: We offer our customers a choice of 2 or 6 bottles. Whether you're using them as water bottles or for infused oils and vinegar you will always have enough. These elegant bottles are BPA, toxin, chemical and lead-free, making it the safest and most durable choice. 30-DAY SATISFACTION GUARANTEE: Your happiness is our priority. If you have any issues, reach back out and we'll promise to make it right with a refund or a replacement, no questions asked. If you have any questions about this product by California Home Goods, contact us by completing and submitting the form below. If you are looking for a specif part number, please include it with your message.